1. Cook your pasta according to the package instructions. 2. Wash the baby spinach and pat the leaves dry with paper towel. Wash the tomatoes and cut into 1/2-inch cubes. Set aside. 3. Slice the fresh mozzarella into 1/2-inch cubes. 4. Drain the pasta and return it to the pot, along with the spinach leaves. Cover the pot and allow the spinach to wilt from the heat, about 1-2 minutes. 5. Transfer the pasta and spinach into a large mixing bowl, add the tomatoes and pesto, and stir to combine. 6. If you are serving the pasta salad warm, add the cheese immediately and serve. If you are serving the salad cooled, allow the pasta to come to room temperature before stirring the mozzarella into the salad. 7. Garnish with salt and freshly cracked pepper to taste and enjoy! 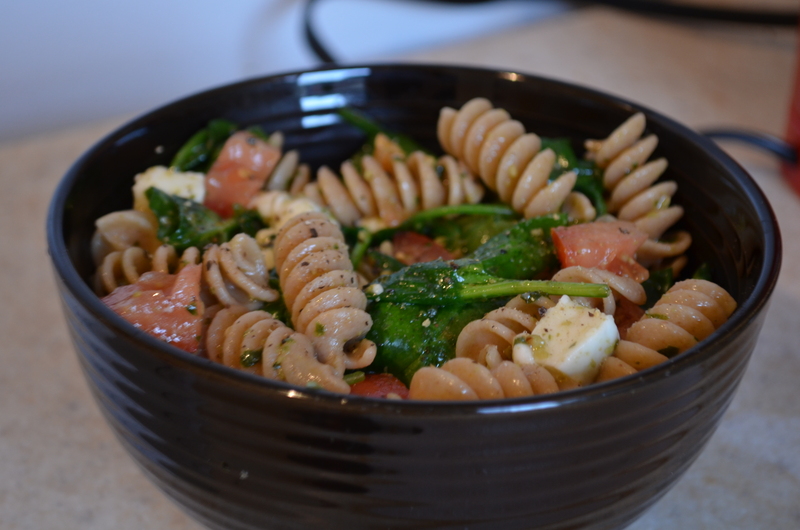 This entry was posted in Entrées, Grains, Greens, Pasta, Quick Meals, Sides, Vegetables, Vegetarian and tagged cheese, easy, mozzarella, pasta, pesto, quick, rotini, salad, side, spinach, summer, tomato, vegetables, vegetarian by laratboulos. Bookmark the permalink.